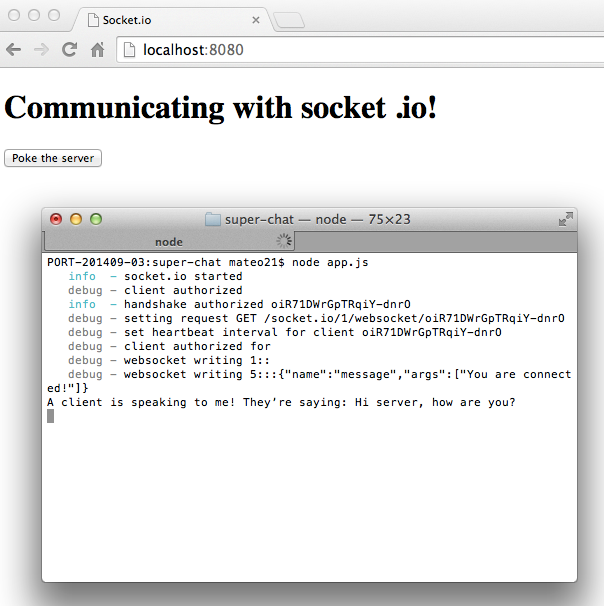 Socket.io: let’s go to real time! Socket.io is one of the most prized libraries by those who develop with Node.js. Why? Because it allows synchronized communication to take place simply within your app, which means real-time communication! The possibilities that socket.io offers are really immense and go far beyond chat. It’s useful for everything that needs immediate communication between the visitors to your website. This can be, for example, the first brick to build a game where we can see characters develop in the browser, all without needing to reload the page! Before starting to code, I would like to quickly explain the idea of socket.io. It’s a library that allows us to simplify a large number of things, but you’d be wrong to think it was ‘magic’. However, socket.io bases itself on a number of different techniques that allow real-time communication (and some of these have been around for years). The best-known and most recent one is WebSocket. WebSocket? Isn’t that one of those HTML5 innovations? WebSocket is a feature supported by all recent browsers. It allows synchronized bilateral exchange between the client and the server. What do you mean I’m speaking Double-Dutch?! Let’s go back to basics again. Communication on the web is usually unsynchronized. The Internet has always been this way: the client requests and the server responds (see next figure). That was fine when the web was starting out, but it’s become too limiting in recent times. We need more reactive and immediate communication. In this diagram, for example, the server can’t decide for itself to send something to the client (for example to say: "oh there’s a new message!"). It has to be the client who reloads the page or takes action to call the server because it doesn’t have the right to talk to the client on its own. WebSocket is an innovation that allows a sort of ‘tube’ of communication that remains open between the client and the server. The browser and the server stay connected to each other and can exchange messages, in one direction and the other, through this tube. So from now on the server can decide on its own to send a message to the client like a grown up (see next figure)! With WebSocket, communication is synchronized: a communication tube stays open between the client and the server. Don’t confuse WebSocket with AJAX! AJAX does indeed allow for the client and the server to exchange information without reloading the page. However, in AJAX, it’s always the client that asks and the server that responds. The server can’t decide for itself to send information to the client. With WebSocket that has become possible! For example, if the browser doesn’t support WebSocket but Flash is installed, socket.io will go through Flash to do the communication in real time. If not, it can use other techniques such as AJAX Long Polling (the client continuously asks the server if there are any updates for them, not the neatest or most efficient method, but it works) or "Forever Iframe" which is based on an invisible iframe that loads progressively to retrieve updates from the server. The good news is that you don’t need to know the details about how these techniques work. However, I think it’s good to at least know their name and that they exist. Internet Explorer 5.5+ (yes, you read that correctly!). Let’s get to the point: how do we use socket.io? I just saved you 15 minutes of your life! Don’t thank me, it’s only right and proper. The server file (e.g. app.js): it’s this one that centralizes and manages the connections of the different clients who are connected to the website. The client file (e.g. index.html): it’s this one that connects to the server and displays results in the browser. I deliberately separated the server code into two parts: at the beginning, we load the server as usual (and retrieve and return the content of the index.html page); then, we load socket.io and manage socket.io’s events. It sends back the index.html file when a client asks to change the page in their browser. It prepares itself to receive requests via socket.io. Here, we are expecting to receive just one type of message: the connection. When we connect via soccer.io, we log the information in the console here. A "classic" connection to the HTTP server to load the index.html page. A "real time" connection to open a tunnel via the WebSockets thanks to socket.io. The code that it contains enables management of communication with the server on the client side, either with WebSockets or with one of the other methods that I told you about if the browser doesn’t support them. Then, we can carry out actions on the client side to communicate with the server. For the moment, I’ve done something very simple: I connected to the server. It’s on my machine, which explains the http://localhost:8080address. Obviously, on the web, the path will need to be adapted to show your website address (e.g.http://mysite.com). 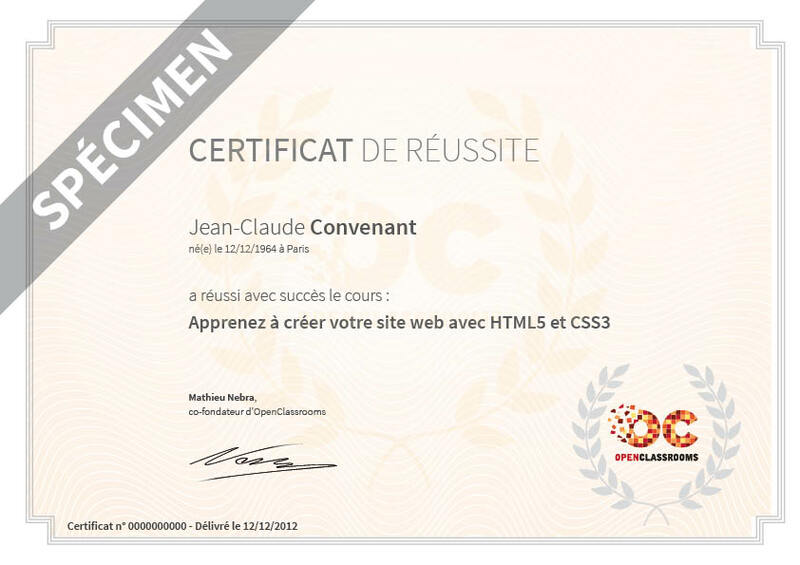 We can then go to our browser at this Node.js address: http://localhost:8080 here. For the moment it doesn’t do anything particularly extraordinary, but we’ve got the basics. Now it’s time to get down to exchanging messages with the server! The server wants to send a message to the client. The client wants to send a message to the server. The type of message that we want to transmit. Here, my message is message type (I’m not very creative, I know). This will allow you to distinguish between the different types of messages. For example, in a game, we could send "move_player", "attack_player" type messages. The content of the message. Here you can say whatever you want. 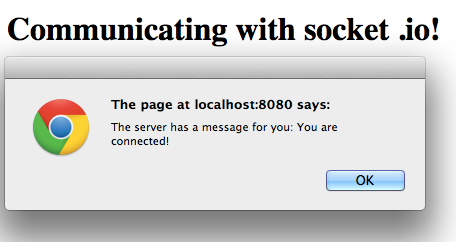 With socket.on(), we listen for message type messages. When the messages arrive, we call for the callback function that, in this case, displays a simple dialog box. Try it. You’ll see that when you load the index.html page, a dialog box is displayed telling you that the connection was successful (see next figure). Now, let’s do it the other way around. I suggest adding a button in the web page that sends a message to the server when it’s clicked on. It’s very simple. When we click on the button we send a message type message to the server, along with content. Launch the code! Click on the Poke the server button on the page and watch the server console. You should see the next figure appear. A client is talking to me! They’re saying: Hi server, how are you? In all our previous examples, we worked with one server and one client. In practice, you will probably have several clients connected to your Node.js application (or at least I hope you do!). To simulate this locally, it’s very simple: you just need to open two tabs, both on the http://localhost:8080 page. The server will see 2 different clients connected. Send a message to everyone at the same time. We call those broadcasts. Remember information about each client (like their username, for example). For that we need session variables. Surprise surprise, that’s exactly what I was going to show you next! When you do a socket.emit() on the server side, you only send a message to the client that you’re currently talking to. But you can do better than that: you can send a broadcast, meaning a message destined for all the other clients (except the one which the server just connected to). Client A sends a message to the server. It decides to broadcast this message and send it to the other clients who are connected: B and C.
Imagine for example a chat. Client A writes a message and sends it to the server. So that the other clients can see the message, it must be broadcast. Now try opening 2 tabs (or more) on your http://localhost:8080 page. You’ll see that when a new client arrives, the other pages react instantly and say: "Another client has just connected!" When you have several clients connected, you’ll soon realize that it is hard to recognize them. The ideal thing would be to be able to memorize information about each client in session variables... but session variables are not enabled by default by socket.io. Actually, session variables need to be managed in another library via a piece of middleware like session.socket.io (they work like the middleware in Express, a bit like plugins). I would probably need to write a whole chapter to show you how to use a piece of middleware that manages sessions. To spare you that, I'm going to give you a magic trick: just save the information as a variable in the socket object of each client. It'll be easy to set up! I'm going to suggest a very simplified technique that you can try quickly. It's not the best method: just see it as a workaround to get started. If you are really serious about managing sessions, then you should use a piece of middleware like session.socket.io. So we want to server to remember information about each client who's connected. This way, the client won't need to remind us who they are each time they send a message! In this example, we store the data in a variable in the client's socket object (remember, the server stores one socket object for each client). Simple, isn’t it? Let’s try to imagine a practical case. When a client connects, the webpage asks them for their username. The server will stock the username in the session variable to use it when the client clicks on "Poke the server". As soon as we receive a message, we ask for the username session variable to be retrieved from the client's socket. Try to open 2 windows giving different usernames each time. Then click on Poke the server. You’ll see the username of the person who clicked on the button in the console! I did the test for myself with two windows, one with the username "mateo21" and the other with the username "robert". In the next figure, you can see at the bottom of the console that it has actually recognized who just clicked! Several clients connected: the server remembers their names! // A dialog box is displayed when the server sends us a "message"
Remember that it’s a basic app to try out socket.io functions. It doesn't do anything interesting or fascinating, it’s up to you to have fun fiddling about with it to practice. Do something exciting with it… or at least something more useful that what I did with it. Socket.io is a Node.js module that allows your visitors to communicate continuously (in real time) with the server when the page is loaded. 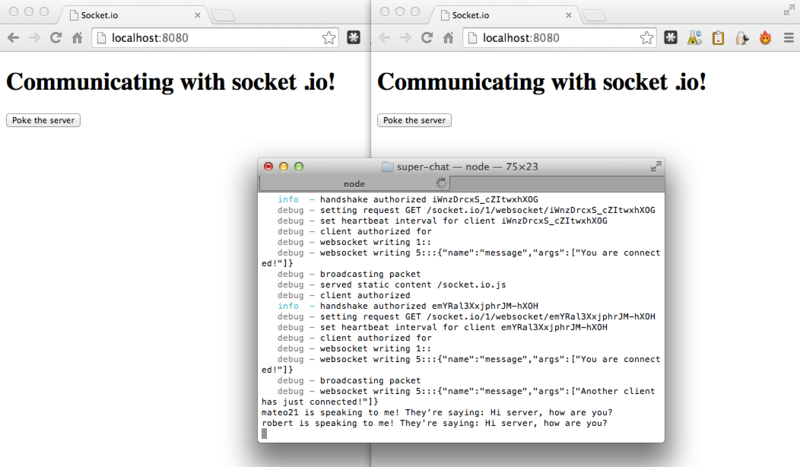 Socket.io is based on WebSockets, a sort of ‘super AJAX’. Your app can call the server at any time without reloading the page and the opposite is also true: your visitors can receive messages from the server at any time! The server and the client send each other events (with socket.emit() ) and listen to the events that are sent (with socket.on() ).